Daniel J. Murphy - dmurphy@shawmedia.com McHenry guard Danny Glick celebrates a win over Crystal Lake South with the McHenry student section Thursday March 1, 2012 at Cary-Grove High School in Cary. McHenry defeated Crystal Lake South 51-44 for the IHSA Class 4A Regional title. McHenry guard Danny Glick celebrates a win over Crystal Lake South with the McHenry student section Thursday March 1, 2012 at Cary-Grove High School in Cary. 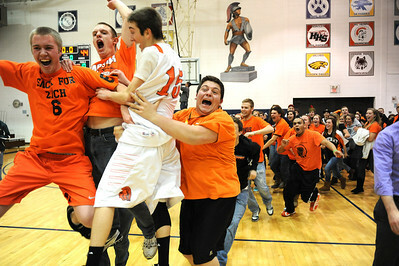 McHenry defeated Crystal Lake South 51-44 for the IHSA Class 4A Regional title.